Tradeshift partners with (RED) to facilitate donations to the Global Fund to fight AIDS, tuberculosis and malaria. Pymnts interviews Socure CEO Sunil Madhu. Payoneer selects AU10TIX to enhance online customer ID authentication and record generation. AlphaPoint appoints Scott Scalf as EVP of Development Operations. Alumni from both Finovate and FinDEVr are featured in AlwaysOn’s OnFinance “50 Companies to Watch” roster released this week. AlwaysOn’s OnFinance “50 Companies to Watch” highlights “early to mid-stage startups focused on honing fintech innovation” that are effectively taking their technologies to market. This ability to “capitalize on enormous market opportunities” is what AlwaysOn uses to distinguish its “50 Companies to Watch” from its “Top 100” list published earlier this month. “(The 50) are positioned at the inflection point of growth and are quickly emerging as contenders that are earning global recognition,” write the editors. See for yourself. The full list is here. Below are the nine Finovate and FinDEVr alums that made the cut, along with a link to their most recent appearance on stage. Temenos partners with Microsoft to launch T24 country model bank for Mexico. Coinbase adds support for FIX protocol for trade-order management. MasterCard and Kabbage partner to make Kabbage’s data and platform available through its network of acquirers. If setting up an e-commerce marketplace is hard, setting up your own digital currency-exchange may be levels of magnitude more challenging. Fortunately, there are companies like AlphaPoint that specialize in building customized digital currency exchanges—including bitcoin exchanges—in less than 20 days. While bitcoin drives the digital currency bus in many ways, the proliferation of cryptocurrencies and altcoins means that exchanging value between alternative and traditional currencies is more complex than ever. AlphaPoint sees its role as two-fold: helping digital currency exchanges cope with the demands of their enterprise clients, and making it possible for startups and new companies to enter the market with the latest in technology. AlphaPoint CEO Vadim Telyatnikov has referred to his company as the “Intel Inside” of digital currency exchange. As a white-label digital currency-exchange platform, AlphaPoint serves the fintech industry in three main ways. Helping established companies looking to add digital currencies to their product mix. Delivering better performance, more functionality, and additional features to existing digital currency exchanges in need of upgrades. For their Finovate debut, AlphaPoint choose to demonstrate their platform’s newly overhauled front end. Enhancements include new order types, improved scalability, and faster processing speed. AlphaPoint 2.0 is a high-performance platform that allows users a wide range of customization options. The platform’s modular, widget-based design gives operators a lot of control over how visual data is displayed. The platform includes six predesigned templates, though users are “encouraged” to develop templates of their own. AlphaPoint also lets FIs configure, track, and trade their own currency pairs and combinations—fiat to fiat, commodity to fiat, and fiat to virtual. The robust technology features error-detection codes for each record, and quick fail-over support to provide “best-of-breed” security and reliability. The platform also comes with Quantum Front, an system-admin resource that gives operators a wholistic view of users, risk, trading activity and more without being limited to the functionality of a web browser. AlphaPoint’s platform is available as both a fully branded and white-label solution. The technology is fully supported on both Windows and Linux operating systems, and supports both FIX and FAST API connections to make it easy for traditional FIs in particular to deploy and use. AlphaPoint came into 2015 with the momentum of a $1.35 million fund-raise at its back. 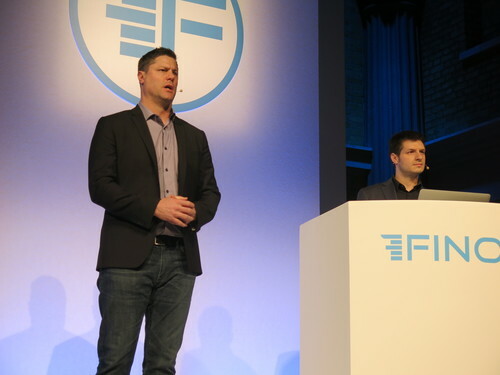 Following its Finovate debut in February 2015, PaymentEye called AlphaPoint one of the top demos of day two, and many observers credited the company for helping keep bitcoin and cryptocurrencies in the conversation at the London conference. 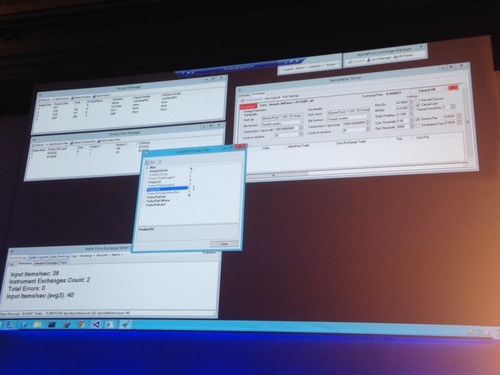 See AlphaPoint’s live demonstration video from FinovateEurope 2015. AlphaPoint is here to launch version two of its Digital Currency Exchange Platform. AlphaPoint’s exchange platform is leveraged by institutional and retail exchanges globally, powering their digital currency exchanges. The company’s proprietary platform also serves as a digital exchange gateway for organizations looking to upgrade their existing systems to digital currencies. AlphaPoint offers 24-hour run-time capabilities and provides a customizable, scalable, and secure platform. Our database is a next-generation design, built with military-grade security practices. At FinovateEurope 2015, we are demonstrating a new-and-improved “v2” of our exchange technology platform, which features a redesigned and customizable front-end template, new order types, improved scalability, and an even faster processing speed. HQ: New York, New York, U.S.A.
It’s hard to believe, but it’s true: we’re less than one month away from the first Finovate show of the year. FinovateEurope 2015 is returning to Old Billingsgate Market Hall in London for what promises to be our biggest event in Europe yet. We hope you will be able to join us as 70 companies from across Europe and around the world demonstrate some of the latest in financial technology. AlphaPoint’s Digital Currency Exchange Platform allows institutions to establish their own internal digital currency exchanges. AlphaPoint’s secure, scalable, and customizable exchange platform is easing the adoption of digital currencies across the globe. Ventura has over 15 years of software architecture experience specializing in secure, scalable, and high performance financial systems for companies such as Deutsche Bank, UBS, and Merrill Lynch. Bambacigno joined AlphaPoint at the start of 2014 and has led the acquisition of over a dozen global clients. Avoka enables your omni-channel digital banking business with frictionless account openings. Create an engaging digital loan application from any device in 3 minutes or less. Corcoran has over 20 years experience in financial services globally, delivering frictionless customer experiences for digital sales and service transactions. Encap Security will demonstrate how financial institutions can use Touch ID and Encap’s authentication platform to provide access to and authenticate high-value financial services transactions. Authentication works best when a number of factors are used – and the factors used are contextually appropriate to the risk of the activity taking place. Jorgensen has over 10 years experience in the mobile financial services, identity management, and mobile application security sectors. investUP is the crowdfunding supermarket, allowing you to lend & invest across all your favorite P2P, debt, and equity sites. Only with UP can you enjoy one account and one portfolio, yet still lend and invest across all your favorite crowdfunding sites. Tuckett is a full-time crowdfunding evangelical from an aerospace engineering and accountancy background. Founded UP in 2012. Nostrum Group is pioneering digital lending – providing customers with the ability to service their own accounts where and when they want. Loan technology that re-imagines what a customer wants from banks and how they can interact with financial products. Carter leads the organization and is responsible for setting the company. He is passionate about customer experience, innovation, and technology – inside and outside financial services. StreetShares connects businesses with retail and institutional investors who compete to lend to businesses. Business lending meets social affinities. StreetShares borrowers get funded at competitive rates while investors get the returns they’re looking for. Everyone wins. Rockefeller’s goal is to breathe new life into the American dream for a new generation of small business owners. 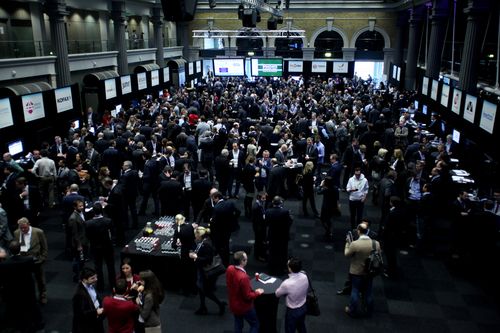 Tickets for FinovateEurope 2015 are on sale now. Visit our registration page today and save your seat at the show.